These are becoming very popular. I have seen them on several websites and in magazines. So I have done a simple 'How-To' so you can learn to create this look. For this look you need a knowledge of French-braiding. This is where you have 3 sections of hair that are braided together. Working down the head adding a little more hair to each section as you go. For those of you unfamiliar with 'Ducth Braids' you are essentially braiding the hair under its self (I've heard people refer to this as braiding 'back to front'). Each time to add a new section of hair you take it 'under' rather than 'over'. If that makes sense? My models hair was shoulder length. I started the Dutch Braid on the right of her head and took my sections on the diagonal. Ending it on the bottom left. Once I had finished working along the scalp, I braided to the end of her hair and secured in a clear band. 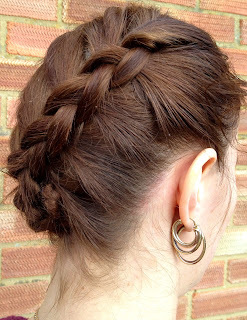 If you wish, you can wrap the end of the braid on its self creating a twist which you can pin into the nape. Thus keeping all of her hair up and out of the way. The 'must have' hair tool!